Iridium's new product Certus, drew quite a crowd in Santiago, Chile—there was Iridium, Cobham Satcom and Thales that also showcased the upcoming Certus satellite data services and terminals in relationship with each of the company's services. The open event revealed the excitement about Iridium's Certus, the new packet switched data mode service that was made possible by a complete modernization of the Iridium satellite fleet known as the Iridium Next constellation. The service will start with speeds of 352Kbps (symmetric through some terminals), which during 2019 will increase to 704Kbps, surpassing L-band service offerings from other providers and presenting an attractive profile for mission-critical military and civil mobile communications, capable of operating even at the north and south poles. With the presence of staff from all four companies, the general public and local partners together they were able to clarify any doubts and learn details about the installation and operation of the Certus terminals from Thales and Cobham, which is going to be available soon for purchase through Globalsat. Essential customers from mining, telecommunications, energy, finance, government and other sectors witnessed the excellent content delivered by the experts (see photo on the right), asked questions, got answers and later enjoyed a cocktail to celebrate at the end of the activity and the start of new business opportunities. The French company Thales, which is responsible for manufacturing the new Iridium satellites, has made a major first step in the field of mobile satellite communication with the MissionLink product, with an initial version able to access symmetric 352Kbps service, in addition to three Iridium voice lines that can be assigned to multiple local terminals connected over Ethernet or Wi-Fi. A built-in digital PBX, PoE ports, remote management, redundant power, wireless connection, filters for detailed access control and traffic reduction make the Thales Certus offering a complete system for comms-on-the-move. Both the terrestrial and maritime version (VesseLink), will be a competitive offering concerning L-band equipment available for connection to other constellations. The Sailor 4300 from Cobham Satcom is an affordable terminal designed for maritime use, with the added advantage of being compatible with FleetBroadband accessories; it can use the same cable, the same power source, the same pedestal (with an adapter) and even the same handset. When the Iridium Certus service is available before the end of the year, this terminal will communicate at speeds of 352Kbps downstream and 176Kbps upstream, through three general purpose Ethernet ports, and will also connect to up to three Iridium circuit-switched voice lines through a built-in SIP server. Unlike similar previous equipment offerings for other constellations, the 4300 contains no moving parts, therefore it adapts faster and more efficiently to movement. There is no cumulative mechanical wear caused by waves or vibration, and it has an estimated life of 10 years without maintenance, a feature it shares with the Thales terminal and that will probably be present throughout the Certus hardware offerings going forward. With the later upgrade to 704Kbps, these terminals will even present themselves as an option that could replace VSAT in some applications. 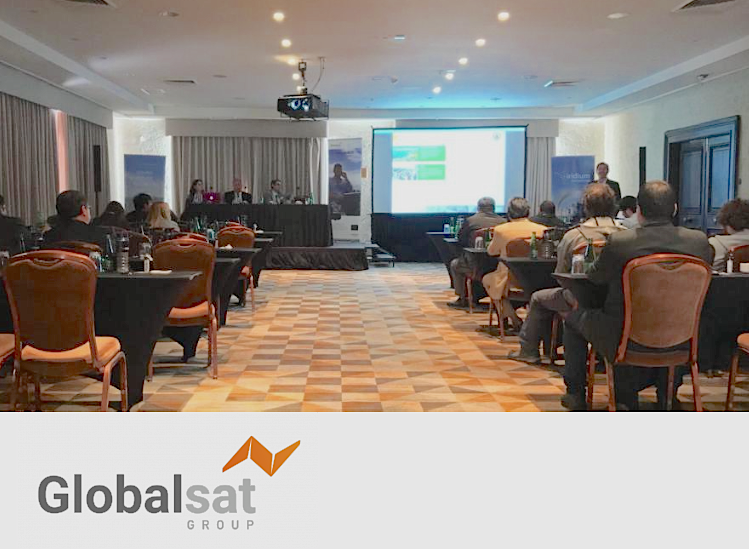 Christian Gerhard, Commercial Director of the Globalsat group of companies, said that there are markets where maritime VSAT has stopped making sense due to the technical advantages of L-band systems. This effect increases with the arrival of Certus, due to both the attractive equipment pricing and its mechanical simplicity resulting in immunity to movement. In the South Seas, this is especially critical, the wear and tear which affects mechanically steered antennas are inevitable and being out at sea without service is no joke. Iridium and its hardware partners are presenting them with a great leap forward in operational continuity for maritime use, and the later addition of a GMDSS accessory will mean a high level of safety at a lower price than with separate systems, as was the case until now when using Inmarsat C for safety and others for data and telephony. Iridium is just one launch away from completing the deployment of its new constellation. It is estimated that the pending launch will take place before October, and a few weeks later the satellites will be all in position to provide global uninterrupted 352Kbps service, with full continuity of traditional Iridium voice and data services, including SBD and PTT. 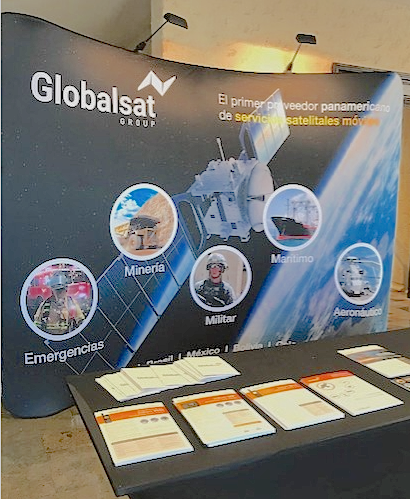 In the event in Chile it was also announced that Globalsat Group is one of the first five companies worldwide to start beta testing of the Certus service using the Thales terminal, which will result in advantages for Globalsat in terms of early familiarity with the product, and will also deliver valuable real-world feedback from the field to both Thales and Iridium, that will help with optimizing the end-user experience.